Today's guest post is by Jequeta Mullins Briskey. Jequeta was the youngest of 11 children and she grew up in Clintwood, Virginia. She didn't start writing until after she was married and most of her short stories and poems are centered around growing up in southwestern Virginia. She currently lives in northwestern Ohio with her husband, John, and they have 3 children, 8 grandchildren, and 5 great-grandchildren. 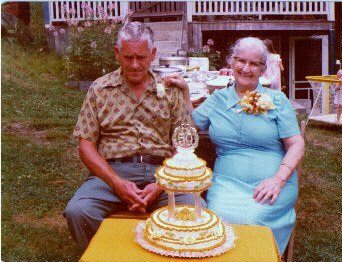 Jequeta's parents at their 50th Anniversary, 1979. That's when I realized how much memories are worth. had lost all it's luster, but serenely stands. The kitchen was downstairs, the bedrooms above. The living room, the "can house"; they were all built with love. The front porch, so big, was adorned with two swings. Relived in my memory, how much pleasure it brings. I remember the river once so clear, flowing free. I remember every rock, every bush, every tree. The animals we had both for food and for fun. The strawberries we picked in the hot blazing sun. The meals my mom cooked on the ancient old stove. We walked to the store 'cause nobody drove. My dad told us stories of when he was a boy. We kids played for hours with our handmade toys. it was time to do quilting and mom was the best. and when it was needed, she could yield a mean switch. My dad was a giant, both gentle and kind. His voice was enough to make us kids mind. to start a new garden to feed all his clan. as I stand there staring at the life I had known. There were no flowers in the yard anymore. The little creek was gone. It had been there before. I couldn't stop my eyes from filling with tears. how time changes things after you've grown. So, I vowed then and there to never return. I would never go back, though my heart it would yearn. I would do it in my memory because memories live on. I hope you enjoy Jequeta's poem as much as I did. I shared one of her short stories, Summer In The Mountains, last month. If you missed it, you can find it HERE.